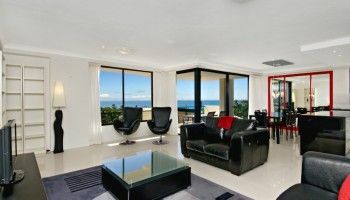 Get ready for the best Kings Beach Caloundra accommodation. 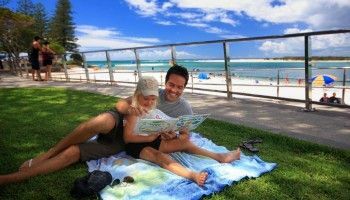 It may not be the newest kid on the block, but it will be just perfect for you and your family when you come to holiday in sunny Caloundra. Imagine days relaxing beside the sea, without a care in the world in this delightful Sunshine Coast style accommodation. Sure the style and decor of the apartments at Burgess @ Kings Beach is individual, perhaps a step back in time, but it never gets in the way, and for some guests offers the faint glow of nostalgia, but for everyone else, this is where holiday memories are made. Burgess @ Kings Beach apartments offer plenty of space, they’re mainly three bedroom Caloundra apartments of varying sizes, but also with a few two bedroom apartments. On request we can upsize your accommodation and increase your view, depending on availability. For some guests, the priority is to keep an eye on their kids, with the lower apartments overlooking the tennis court. Parents can watch from the balcony and offer encouragement, if they are not having a friendly hit with the kids. There’s also the outdoor heated pool and spa, with plenty of sun loungers and sail cloth shade. The pool area is very popular in the evenings with the poolside BBQ. There’s even a sauna to sweat away the working year. Step out to Kings Beach. If the kids have their way, this is where you’ll be spending the rest of your holiday. The lovely and gentle surf patrolled beach offers everyone the opportunity to enjoy the ocean, whether it’s swimming in the surf, wave riding or fossicking amongst the rock pools. The public salt water pools are also a great fixture, providing avid swimmers with a lap pool to maintain their fitness and a kids pool with a much larger expanse of water to play and swim, in a well supervised environment. Parents can relax under the amply supplied shade of the sail cloths. There is also a play area which is equipped with jets of water that are randomly timed — a fun activity for the whole family. What are you waiting for. Get ready for the best Kings Beach Caloundra accommodation. Book now at Burgess @ Kings Beach.